Utah is home to five spectacular national parks that offer visitors to the southern part of the state impressive views of red sandstone cliffs, arches that are perfectly placed for catching a sunset, glimpses into the past through ancient petroglyphs, and more adventure than one could ever imagine. Zion, Bryce, Capitol Reef, Canyonlands, and Arches national parks are known by locals as the Mighty Five. While they can be explored in one epic road trip, we highly recommend spending more than a week breezing through the area to truly get to know these parks. Before we give you ideas on where to go and what to see, here's a bit of information on the formation of the impressive landscapes that capture our hearts and camera lenses. Ancient sand beds and shallow oceans from the Jurassic and Triassic periods solidified into orderly sedimentary layers in vast expanses across the southwest. These layers have each eroded at varying rates as they were pushed slowly upward by volcanic forces deep beneath the Earth's crust, creating what is today known as the Grand Staircase. The landscape of mesas, arches, plateaus, and deep canyons range in age from billions to just a few hundred years old. By the Early Jurassic period, roughly 200 million years ago, the land had transformed dramatically, and the entire Colorado Plateau had become one of the largest deserts in the history of the planet. Massive dunes reached up to 3,000 feet high, constantly shifting and reforming with wind and time. Lithification from the weight of successive layers and the presence of minerals like calcium carbonate and silica froze these dunes and created the Navajo sandstone formation that is so prevalent throughout the parks. This is why the lines of sedimentary layers in Zion’s Navajo sandstone aren’t flat or level; instead, they tend to reflect the windward and leeward angles of a dune. During a period of massive uplift the former seabed rose to the high plateau we know today. This uplift created ideal conditions for rivers, creeks, and even additional inland seas to consistently and forcefully erode of the soft Navajo sandstone into magnificent canyons and gorges. Utah's Mighty Five each claim their own step on the Grand Staircase, starting with Moab's Arches National Park where more than 2,000 sandstone arches tower overhead, and continuing down to Zion, Utah's most-visited national park. Below we've highlighted a few adventures in each park we feel exemplify the beauty and history of the area. If you're looking for more specifics, take a look at our 7-Day Itinerary for Zion and Bryce Canyon and 7-Day Itinerary for Capitol Reef, Arches, and Canyonlands. Or put them together for a two-week road trip. Honestly, one week isn't enough to fully immerse yourself in this incredible part of the country. Delicate Arch. Photo by Brent Uhrig. Arches is a 73,234-acre garden of eroded sandstone fins, towers, ribs, gargoyles, hoodoos, balanced rocks, and arches. There are over 2,000 arches cataloged in the park. This includes the 306-foot Landscape Arch, which is the second largest span in the world. 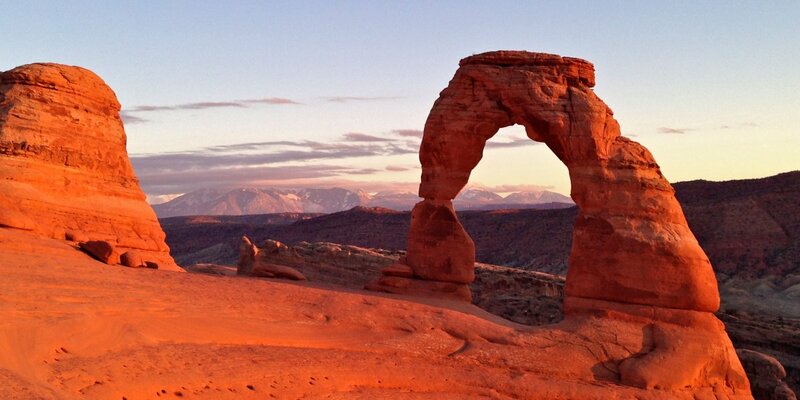 Delicate Arch: 3-mile trails to the beautiful arch that seems perfectly placed for sunset photography. Broken Arch: Easy 2.2-mile trail from Devil's Garden Campground. Devil's Garden Primitive Trail: Longest maintained trail in the park at 6 miles. Fiery Furnace: A labyrinth of sandstone fins and spires that is possibly the most unique area of the park. Klondike Bluffs Trail + Tower Arch Hike: 2.7-mile trail to Tower Arch, one of the least visited hikes in the park. Park Avenue: Easy hike named for it's New York skyscraper-like formations. Sunset at the Green River Overlook a few miles from the False Kiva trailhead. Photo by Denis LeBlanc. 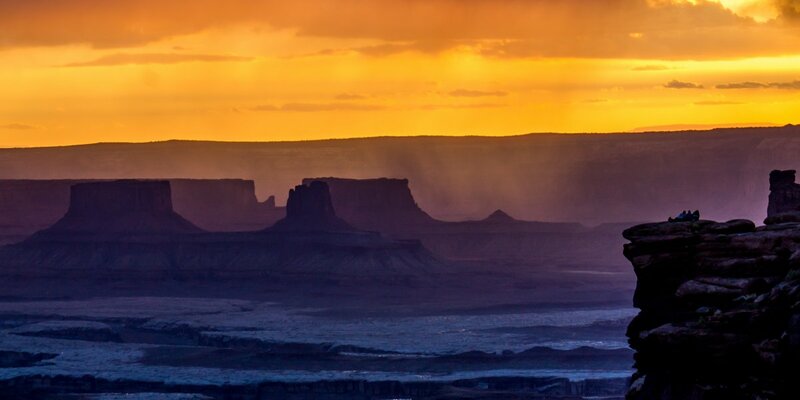 Canyonlands is 527 square miles of deep canyons, towering mesas, cliffs, spires, pinnacles, and home to one of the West's most photographed landforms, Mesa Arch. You'll also find some fascinating archeological sites within the park boundaries. False Kiva: Primitive archeological site with a fantastic view. Aztec Butte: Ancient Puebloan ruins and a fun scramble up some slickrock slopes. Upheaval Dome: Short trail to yet another beautiful view. Horseshoe Canyon: Remote 7.9-mile hike through rock art formations and 2,000-year-old petroglyphs. Needles Overlook: More views that are definitely worth the stop. Green River, Labyrinth Canyon: Paddle the Green River and see the canyon walls from a different perspective. Capitol Reef Scenic Drive. Photo by Denis LeBlanc. 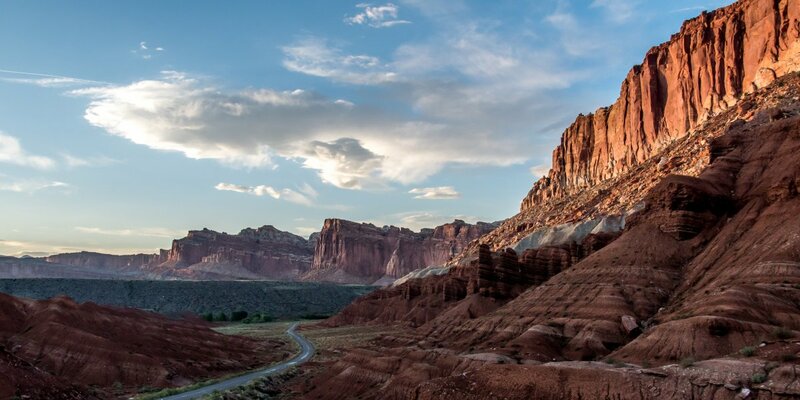 Capitol Reef is Utah's least-visited national park, but it remains equally impressive. It is rich with amazing views, great hikes and one of our favorite campgrounds in the area. Capitol Reef Scenic Drive: Great introduction to the park and access to the main trailheads. Cohab Canyon: Short and challenging hike, but the views are worth it. Rim Overlook + Navajo Knobs Trail: 9.2-mile trail to more impressive views. Cassidy Arch: If you're lucky, you may get the arch all to yourself. Chimney Rock Trail: A steep 3.4-mile trail to...you guessed it, more views! Hickman Natural Bridge: This trail provides a great overview of what Capitol Reef National Park has to offer. Grand Wash Trail to The Narrows: Easy hike through impressive 500-foot canyons. Be mindful of flash floods. Fruita Campground: One of our favorites in all the parks for it's beautiful setting and shade options. Bryce Canyon and Amphitheater from Inspiration Point. Photo by Tyson Gillard. Bryce is best known for its endless fields of red rock hoodoos formed by to wind and water over millions of years of freeze and thaw cycles. There are a number of overlooks that will not disappoint. 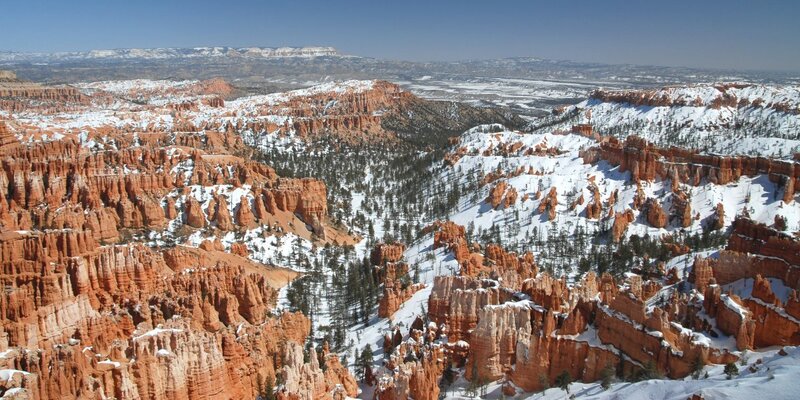 Bryce Canyon Rim, Sunset to Bryce Point: 4.4-mile hike with views that you wont believe. Inspiration Point: Its name says it all. Rainbow Point Overlook: Short hike, amazing views. Fairyland Loop: 8-mile labyrinth through the impressive rock formations of the park. Under-The-Rim Trail to Hat Point: 4-mile hike offering a different view of the park. Navajo + Queen's Garden Loop: 2.9-miles, one of the park's most iconic day hikes. The Narrows. Photo by John Cody. With over 3.5 million visitors each year, Zion is Utah's most visited national park and the seventh most visited in the nation. Most visitors stick to Zion Canyon, but the Kolb Canyons, Kolb Terrace, and Hurricane Mesa also offer unforgettable scenery with slightly lighter crowds. Angels Landing: Iconic trail, but not for those who are afraid of heights. 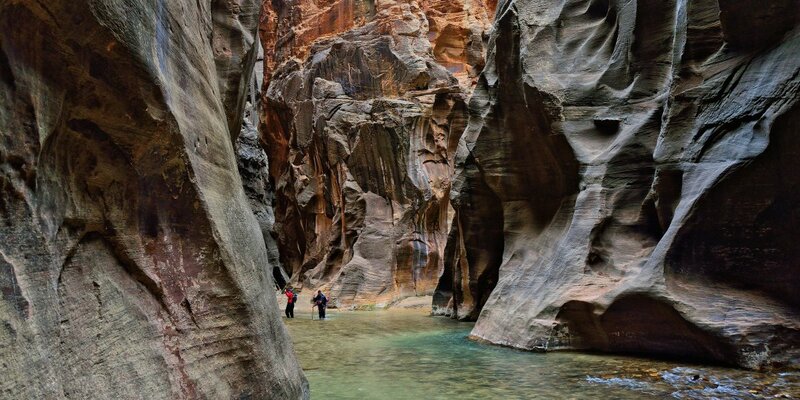 The Narrows: 6-mile hike in the river through the canyon. Be mindful of flash floods. Observation Point: Rivals Angels Landing for the most impressive views of Zion Canyon. Taylor Creek Trail: 5-mile hike to a double arch in the Kolob Canyon area. Lower Subway: One of the park's unique hikes through impressive canyons. North Guardian Angel Climb: Find solitude and a different perspective. Kolob Canyons Viewpoint + Timber Creek Overlook: Beautiful viewpoint and access to backcountry trails. Hidden Canyon Trail: Another trail with great views, but not for those who are afraid of heights. Emerald Pools Trail: Catch this trail in late spring for the most water dropping from the falls as runoff dwindles during late summer and fall.